Rafting adventure specialists offering rides for varying abilities. Situated in the Southern Alps, covering some of the wildest wilderness in the country. Satisfaction guaranteed. Hidden Valleys Rafting can offer rafters anything from a scenic, leisurely paddle through some stunning and serene mountain gorges, to really wet and wild rafting through grade 3 and 4 rapids. They'll take you off the tourist track and show you the real New Zealand of strikingly beautiful bluffs and gullies, breathtaking mountains and no sign of civilisation for miles - except you, of course. If you're after just a half or full day trip, try one of the three different trips on offer. The gentle Waimakariri River Rafting Trip takes you through some of the most unspoilt scenery of the South Island, up by Arthur's Pass, meandering down through hidden gorges and some magical gullies. This is ideal for families, or first-time rafters, and no need to worry about wild currents or unpredictable weather. 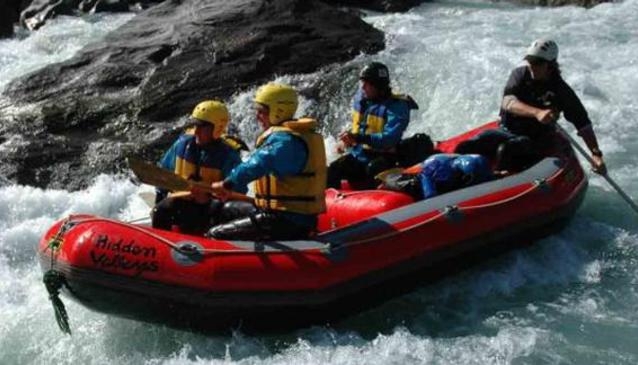 If you've already had some rafting experience and just want to brush up your skills, or you have children who are confident on the water, try the Rangitata River Rafting Trip, near the Peel Forest Camp Ground. Although it's a gentle ride, you still get to encounter some boulder action and some playful rapids, and you can start and finish the trip at a number of locations along the route, just ask when booking for which stop-off point is closer for you. More active rafters, however, will want to head straight for the Rakaia River Rafting Trip. The rapids are grade 2, so still accessible for relative beginners, but there's more pace here, not least because you'll be arriving at your starting point by a very fast jet boat, a thrill in itself, and from where you'll then paddle back down to the bridge at your leisure. Hidden Valleys also conducts Heli-Rafting Trips, with a helicopter transporting you into some of the region's most hard-to-reach places, which is why the company is so well-named. Once you're 'dropped' into these secret and magical valleys, it's up to you and your guide to get back down the river to the land of the living, but these are trips you will never forget. There are also Multi-Day Rafting Trips available, for all abilities. 2-5 day tours cover the whole gamut of white water requirements, from the gentle Waimakariri River 2-day jaunt, through to the 3-day Waiau River trip for intermediate rafters, and the thrills and spills of the 3-day Landsborough River tour, full of challenging grade 3 and 4 rapids. Also available from Hidden Valleys are guided walking tours up through the mountains of the Southern Alps and this beautiful back country, together with Tailored Adventure Tours, where you run the show and decide which activities to try and in which areas, it's all up to you! Heli-Rafting & Tailored Adventure Tours - price on application.